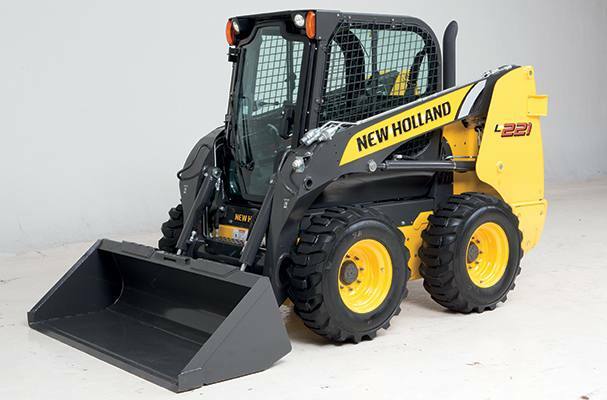 Whether you need to dig, push, lift, trench, load or haul, you will get it done fast with a New Holland skid steer loaders. You get outstanding breakout force, dump height, stability, visibility and comfort. A wide array of attachments expands the versatility of your 200 Series skid steer loader. Whatever job is on the schedule—scraping, loading, stacking, drilling, carrying, leveling and more—there’s an attachment that helps you get it done. Add the hydraulic mount plate option to make attachment changes without leaving your seat. Connect under pressure (CUP) hydraulic fittings are standard equipment for simple hydraulic hook-up of attachments. By pushing on the fitting, you release hydraulic line pressure in both machine and attachment. (Optional high-flow auxiliaries shown). Rock-Solid Stability: The long 200 Series wheelbase, combined with a low center of gravity and the correct front to rear weight distribution provides the stability to move larger loads smoothly. Operators appreciate the smooth, stable ride too. Radial Arm Boom Offers More Digging and Pushing Power by Design: The L213, L216 and L221 feature radial-lift boom geometry, with the boom connected directly to the frame for outstanding pushing and excavating power. Maximum reach is achieved at roughly eye level for ideal loading and unloading of flatbed trucks and trailers. Work with Speed and Confidence: Comfortable operators work more efficiently and with less fatigue. Comfort is built in to 200 Series skid steer loaders with industry-leading dimensions, options and ease of operation. Unmatched All-Around Visibility: Visibility is a significant advantage when you choose a New Holland skid steer. You’ll maneuver with confidence thanks to a clear view in all directions. There’s a low threshold to the front, a large window and low engine hood to the rear, large screen openings to the sides, and you can even see up to a raised loader boom thanks to the see-through area on the cab roof. Superior Comfort: No matter which model you choose, you get a cab that’s one of the widest in the industry, with more head room and shoulder room. The entry foot well is flat for easy entry and exit. Ergonomically designed joystick controls come naturally to your fingertips. The Controls Are Up to You: Choose control levers to match your preference—mechanical or electro-hydraulic switchable (ISO-H pattern). A Clean, and Quiet Environment: The enclosed cab option adds even more comfort. A huge glass door opens wide for easy entry and exit. When closed, it provides superior visibility to all corners and creates an open, uncluttered sense of space. The cab is sealed to reduces dust infiltration, and the heater/defroster kit and optional air conditioning allow you to control the climate in any weather. Air vents are strategically located to cover operator extremities as well as defrost the door and windows. The optional heated, cloth upholstered, air-ride seat gives maximum support and eliminates fatigue. Full-covering, noise-absorbing trim leads to quiet sound levels in enclosed cabs. High Performance in Demanding Conditions: New Holland skid steers are reliable workhorses that stand up to any challenge you face. Reliable engines deliver powerful performance, yet use less fuel and are easy to maintain to decrease your operating costs. Clean, Fuel-Saving Power: New Tier 4 engines not only dramatically cut emissions, they provide the same power and torque as previous engines—all without increasing engine rpm—and that translates into fuel savings of at least 4%. ISM Engine - Clean, Compact, Quiet and Easy to Service: The combustion chamber and injection system use fuel efficiently and deliver outstanding power rise and torque. Low emissions and an energy-saving design make these engines as friendly to the environment as they are to your budget. The rigid cylinder block, small bore dimension and multiple cylinders lead to low noise and vibration—from idling up to maximum power— for added comfort and ease for operators. Responsive Hydraulics: In-line hydraulic pumps allow for fast cycle times and produce less noise and provide extra-smooth, quiet operation. Optional high-flow hydraulics on the L218 through L223 and enhanced high-flow hydraulics available on the L230 allow you to run attachments hour after hour. Smooth Travel: The dual-range transmission can provide travel speeds in excess of 11 mph to save time between jobs. It is standard on the L220, L225 and L230 and an option on the L218, L221 and L223. Maintenance Made Easy: When service is easy, it’s more likely to get done. That’s why New Holland makes it easy to reach all daily maintenance checkpoints by opening the rear hood and door. Unrivaled Access: The convenient New Holland flip-top cab allows you to tilt the entire cab assembly forward, if necessary, for complete access to your machine components. Type: Diesel 4-stroke, T, I.D.I.